At the recent bi-annual conference sponsored by the American Association of School Librarians, newly conceived learner standards were adopted! The standards are forward-thinking, and, if national and state policy follows this lead, our education system will turn in the right direction! Basically, the standards presume that learning is a life-long process and describe the domains of learning as: Think, Create, Share, Grow. The “Think” domain contemplates curious learners who seek out knowledge. “Create” considers the application of knowledge to new situations. “Share” looks toward learners who participate ethically in a democratic society. “Grow” encourages learners to pursue personal and aesthetic aspirations. These four domains advocate circular learning processes and are the pillars for the foundational frameworks that follow. 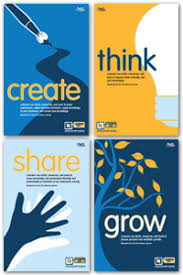 New AASL Standards stand on the pillars: Think, Create, Share, Grow! I. Inquire – Build new knowledge by inquiring, thinking critically, identifying problems, and developing strategies for solving problems. II. Include – Demonstrate an understanding of and commitment to inclusiveness and respect for diversity in the learning community. III. Collaborate – Work effectively with others to broaden perspectives and work toward common goals. IV. Curate – Make meaning for others by collecting, organizing, and sharing resources of personal relevance. V. Explore – Discover and innovate in a growth mindset developed through experience and reflection. VI. Engage – Demonstrate safe, legal, and ethical creation and sharing of knowledge products independently while engaging in a community of practice and an interconnected world. View a graphic representation of this explanation here. Spread the word to fellow literacy professionals, and advocate for AASL’s newly conceived 21st century approach to learning! !